Introduction (F. Andersson, P. Lhoir). Conifers. This volume. Evolution and origin of conifers. Present distribution of northern and southern conifers. Notes on distribution of present families. Synopsis of the volume. References. Appendix. Geographic and altitudinal distribution of some conifers.Section II. Structure, dynamics, disturbances and utilisation of conifer forests. Boreal forests of Eurasia (H. Hytteborn et al.). Definitions, distribution and limiting factors. Regional variation. Nordic approach to classification. Dark-coniferous forests. Light-coniferous forest. Small-leaved deciduous trees. Broad-leaved trees and the boreo-nemoral regions. The role of disturbances in the dynamics of Eurasian boreal forests. References. Boreal forests of North America (M.G. Weber, K. Van Cleve). Distribution of the North American boreal forests. Boreal forests tree species and their environment. Successional patterns in relation to natural disturbance. Regional and global significance. Conclusions. References. European non-boreal conifer forests (J. Timbal et al.). Introduction. Chorology and ecology of native conifer forests. Artificial conifer forests. Animal communities - birds and mammals. Natural and anthropogenic disturbances. Silviculture, management and utilisation. Outlook. References. 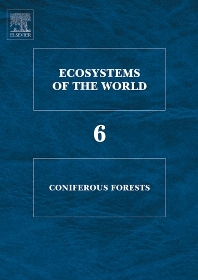 Coniferous forests in the temperate zone of Asia (Y. Nakamura, P.V. Krestov). Introduction. The area and vegetation zonality. Conifer forests of the temperate zone and the oro-temperate belt. Boreal belts within the northern temperate zone. Subalpine krummholz within the temperate zone. Concluding remarks. References. Appendix: Main dominant conifers. Non-boreal coniferous forests of North America (R.F. Powers et al.). Introduction. Western interior forests. Western coastal forests. Eastern coastal plain forests. Central interior forests. References. The coniferous forests of South America (T.T. Veblen et al.). Introduction. Conifer forests of tropical and subtropical South America. Conifer forests of temperate-latitude South America. Conclusions. References.Section III. Functional aspects on conifers and conifer forest ecosystems. Special aspects of the physiology of conifers (R.B. Walker). Introduction. Structure and development. Metabolic processes. Physiological relations in trees and stands. References. Primary production, yield and carbon dynamics of conifer forests (D.A. Maguire, A. Osawa, J.L.F. Batista). Basic principles. Patterns in gross and net production over time. Patterns in growth and yield over time. Silvicultural influences on allocation of growth, yield and net production. Global patterns in net primary production and carbon dynamics. Carbon dynamics. References. Water cycling in conifer forest ecosystems (H. Grip, J-E. Hällgren). Introduction. Ways to estimate transpiration and evaporation. Water balance. Catchment processes. Water uptake. Evaporation. Transpiration. Water use efficiency. References. Nutrient cycles in conifer forests (D.W. Johnson, D.W. Cole). General concepts of cycling. Relationships of cycling to forest management practices. Effects of global atmospheric changes on nutrient cycling. Conclusions. References.Section IV. Economy and management of conifer forests. Importance of conifer forests seen in a global perspective. Introduction. The quality of statistics. The world's conifer forests. Utilization. International trade in forests products. The economic importance of forests and forestry. The total value of forests. Trends. The future. Conclusions. References. Silviculture and management of conifer forests (G.F. Weetman). The nature and objectives of conifer silviculture and management The history of conifer silviculture. Factors which control conifer silviculture. Why do it? The challenges to the practice of conifer silviculture. References. Nutritional management of conifer forests (R. Harrison, J. Prietzel, R. Jandel). Introduction. Effects of nutrients on forests and assessment of nutritional status. Maintaining and enhancing forest nutrients. Overview of nutritional management programs and practices. Summary. References.Section V. Multiple role of conifer forests. Recreation in conifer forests (J.A. Wagar, G.W. Sharpe). Introduction. Origins and history. Culture, law and economics. Management. References. Systematic list of genera. Author Index. Systematic Index. General Index.